Dwarf yaupon holly Small soft spineless leaves. No berries. Grows to 2 ½ feet tall and 3 feet wide. Can be kept more compact with shearing. Good replacement for boxwood. Dwarf Chinese holly Three-inch leaves with many spines. Deep green. No fruit usually this or for sure the parent Chinese. Grows 3 feet tall and about as wide. Good pedestrian and animal barricade. Don’t use if you garden barefooted. Carissa holly Three inch flattened leaves with single spines at ends. Medium green. Similar form to Indian hawthorn. No fruit usually. Grows to 3 feet all and about 3 feet wide. Dwarf burford holly. Dark green foliage with single spine at ends of each leaf. Large, red berries on all plants in winter. Grows to about 2 feet tall and 3 feet wide. Very dependable and durable shrub. Berries jubilee holly. Resembles dwarf Chinese holly, but with larges leaves and taller, more open habit. Very large, red berries. Grows to 3 ½ feet tall and wide. Plant a few maybe. There are better choices. Dazzler holly. Similar to berries jubilee, but taller and more open growth. Very light, bright red berries. Grows 4 to 5 feet tall and wide. Again, there are several better choices. Foster holly. Leaves are small and multiple-spined. Compact, upright growth. Red berries in winter. Slow grower to 20’, spread of 10’. Needs deep soil. First Lady yaupon holly. Foliage resembles standard yaupon but plants grow only 5 feet tall and wide. Lots of red berries, in winter. Relative newcomer and may be hard to find in retail stores. A few of these shrubs would be worth trying. Burford holly. Grows 10 – 15 feet tall and 8 – 10 feet wide with age. Leaves have single point at ends. Many large, red berries. Rather stiff habit. Good screen for landscapes but not as dependable as Nellie R. Stevens. Willow leaf holly. (Also known as Needlepoint holly). 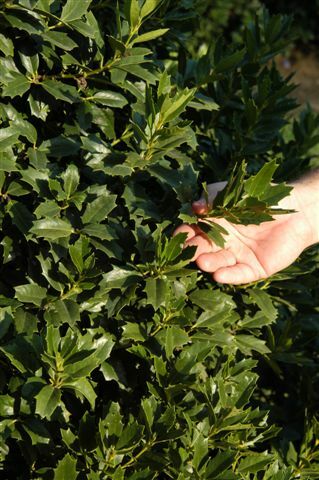 Same habit and size as standard Burford holly, but with flatter leaf blades and more relaxed habit. One of our more reliable producers of large, red berries. Mary Nell holly. Large, deep green 3 to 4 inch leaves with toothed margins. No fruit grows 8 – 12 feet tall and 6 to 7 feet wide. Weeping yaupon holly. Grows 10 to 15 feet tall and 4 - 5 feet wide. 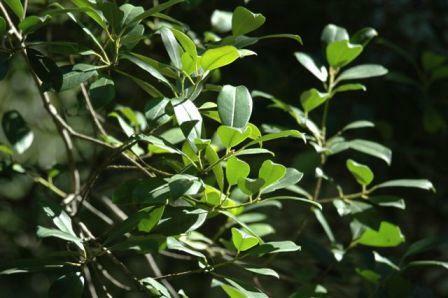 Small leaves like regular yaupon holly, very heavy texture because of habit of growth. Small bright red berries in winter. Nellie R. Stevens holly. Maybe the best holly for privacy screen. Dark green leaves and large red berries in winter. Each leaf has several spines, but they are not especially prickly. Grows 15 – 20 feet tall and 10 – 12 feet wide. 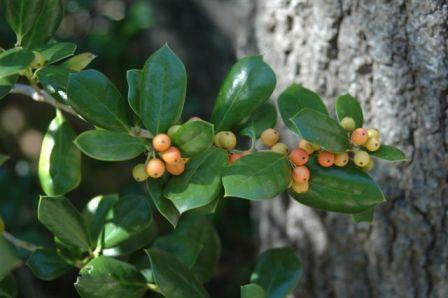 Yaupon holly. Large shrub that can be trained into an ornamental tree form. Grows 15 to 20 feet tall and wide. Female plants bear huge numbers of small, red berries. No spines on leaves. Smooth gray trunks. Possumhaw holly. Deciduous leaves similar to yaupon foliage. Growth habit similar to tree-form crape myrtles, to 12 to 15 feet tall and 8 to 10 feet wide. Medium-sized orange or red berries on female plants only. Variety “Warren’s Red” has larger, redder fruit than the species. Luster leaf holly. Large evergreen leaves to 4 – 8” in length. Upright growth matures at 20 – 25’. Small yellow flowers followed by brick red berries on female plants. Male and female plants needed for good berry production. Wirt L. Winn holly. Is a cultivar with dense structure and excellent foliage color. Savannah holly. 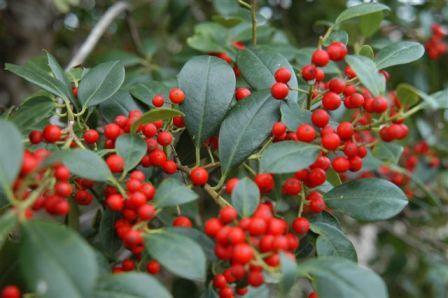 An upright holly tree to 30’ that has a spectacular show of red berries in the winter and small white flowers in spring. Several soft spines on each leaf. Grows significantly better under an organic program. Oak leaf holly. On of the most popular of the red holly series. 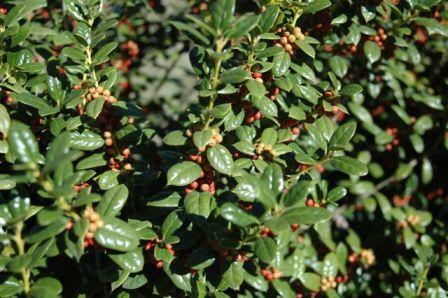 Evergreen holly with red berries in winter. It is columnar up to 8’ in height, but becomes more pyramided with maturity. Maximum height is usually around 18’. Dense, handsome holly with a spread of about 8’. ANSWER: Both of those would be good in your situation, but you also should look at the ‘Savannah’ and ‘East Palatka’ varieties. ‘East Palatka’ is my favorite. It will grow taller and more treelike than the others, but it may be hard to find. ‘Savannah’ probably will have the most berries. Some of the most impressive ‘Savannah’ hollies in Dallas are at Texas Discovery Gardens at Fair Park.